Have you ever pictured your dream pool? Maybe it’s an open, welcoming infinity pool with rock tile around the edge, allowing you to escape the hot Arizona summers. Perhaps you have rolling waterfalls, with water splashing down and transporting you somewhere exotic. Or maybe you’ve got fun and exciting slides that the kids love along with an outdoor kitchen for get togethers with your friends. When it comes to building a custom pool, you have complete control. 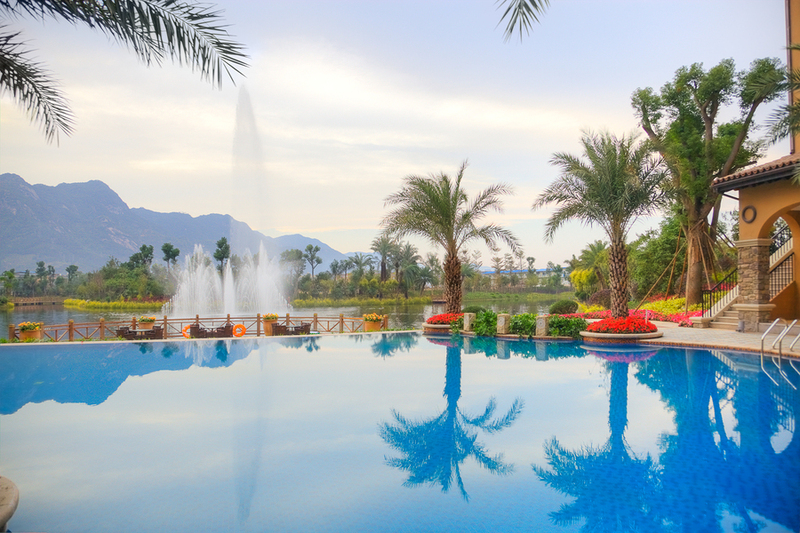 You can let your imagination go wild and No Limit Pools & Spa can help make your oasis vision a reality. We are a family operated pool company serving Gilbert, Mesa, and the surrounding Phoenix, Arizona area. We can turn your dreams into tangible blueprints, with custom pool and backyard construction. ● Infinity pools. These specially designed pools give the illusion that they’re touching the sky, blending the blue water with the blue above. This is the ultimate luxury. ● Fireplaces. Keep warm on cooler nights and make your outdoor area perfect for year-round entertainment. These add versatility to your custom pool area. ● Grills. Create a perfect place to make summertime lunches and dinners with a custom grill area. Summer is synonymous with grilling, so make the most of it with something you truly love! ● Shade structures. Protect you and your loved ones from the harsh Arizona sunshine with a pagoda, deck, or other shady section. This is the perfect place to lounge and relax. ● Kitchens. If you or someone in your family loves to cook, why not bring it outside? An outdoor kitchen is a wonderful way to keep hosts and guests more connected. ● Waterfalls. Hear water rushing off rocks with a feature that both children and adults will love. If you’re looking for something that will truly set your pool apart, this is a wonderful addition. ● Specialty steps. We can build shallow steps that are perfect for lounging directly in the water or for young children. It will make your pool more enjoyable and much safer. ● Hot tubs. Bask in complete relaxation with warm, bubbling waters all around you. Experience the joy of a spa day right at your own home. ● Unique shapes. We don’t just stop at rectangles, ovals, and kidney shapes. If you’re looking for something especially memorable, we can help you choose on a beautiful shape that will complement your backyard. ● Lighting. Get even more use out of your pool or backyard space with custom lighting that adds atmosphere. Ideal for those who are thinking of nighttime parties or who simply want to see their pool glow. Why Should You Go With A Custom Builder? When looking at your options for pool construction in Gilbert, you might wonder if you should go with a custom pool company or if you should go with a more common, but less customizable, option. Obviously, we’re a pool company in Phoenix that firmly believes in investing in your backyard, but you need to ask yourself if you do. This is your home, after all, and in the end it’s so much more than just a yard; actually, it’s a place where you welcome your friends and family and where you relax in your own private retreat. It is a truly special place, and we believe it deserves special care. ● That your satisfaction will be our number one priority. ● That nothing will get lost in translation—we want to be clear and communicate well every step of the way. ● Professionals who know about the latest trends in the business. We understand that a pool, outdoor kitchen, spa, or other structure is a big expense, but working with a local pool company in Phoenix will greatly increase not only your happiness in your own home but also your house’s actual value. It is an investment in your beautiful home, and you deserve to love every part of it. We are a pool company that prides ourselves in a process to will help you discover the best design for your space in the Phoenix area, planning from the start the details that you’ll love. Small accents and little things add up, and we put just as much value on the big, important things as the tiny preferences you have. After all, we want you to feel like this is your dream oasis come to life! We can only achieve that with the utmost attention to detail. If you’re considering renovating or upgrading your backyard, give No Limit Pools & Spa a call at (602) 421-9379 to schedule a consultation. As Phoenix’s premiere pool company, we can’t wait to help you make it a reality!